Black raspberries and brown sugar sweeten this oatmeal muffin recipe. A summer treat when berries are in season, or use frozen berries to enjoy summer flavor year round. I grew up in a household that produced some of the food we ate, and that is a value I've carried with me into adulthood. Because we move around, in some homes the food production has been small--a few pots of basil and rosemary by the kitchen window, or mint in the ground next to the air conditioner (condensation means I hardly needed to water). Currently my backyard garden, my Edible Foodscape, is the largest it's ever been--and that's probably small by most folks' standards, but I've got a postage stamp size yard and am making much with it. I've got 5 raised beds, each about 2 feet by 5 feet, made by my spouse from an upcycled cedar privacy fence. In these beds are garlic, tomatoes, tomatillos, peppers, spinach, cucumbers, basil, peas, dill, and the volunteer squash for the season. I've got a perennial herb area interplanted with perennial flowers, a small strawberry area, peach trees and an ever-expanding raspberry patch. My best producer by far is the raspberry patch. Once I figured out the best time to prune away the spent canes [I do it in the Spring, once the leaves appear. That makes it easy for me to locate the dead canes and remove them] I'm able to keep the overall picking area accessible for my minions. And the dogs, the birds, the other assorted Certified Wildlife who consider my yard their habitat and help themselves. Now that I've got all these black raspberries, and to a lesser extent red raspberries, I'm using them in recipes. I've shared my Black Raspberry & Goat Cheese Crostini recipe and my Black Raspberry, Pistachio and Goat Cheese Salad recipe. It's wonderful to add a handful of fresh berries to a dish. Today, as it is Muffin Monday, I've got a muffin to share with you. This is what I mean by just barely combined. 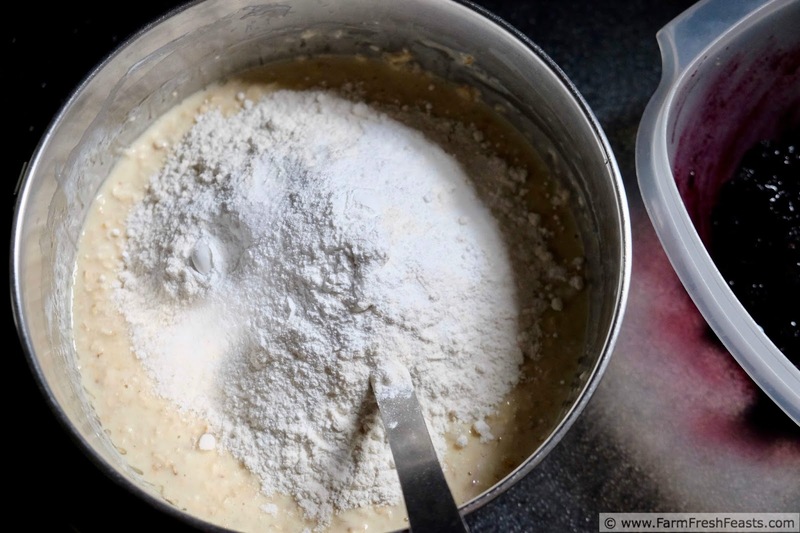 The batter is not uniformly mixed. 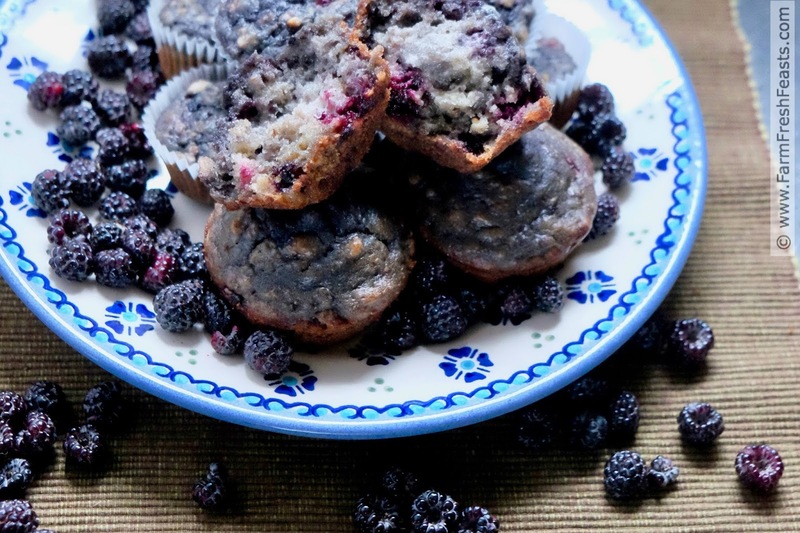 I wanted to macerate the berries to spread both the flavor and the color throughout the muffin. They are quick dark--when you think of eating the rainbow and eating a variety of deeply colored fruits and vegetables, well, this one is for you. I suspect using red raspberries would result in a lighter colored muffin. 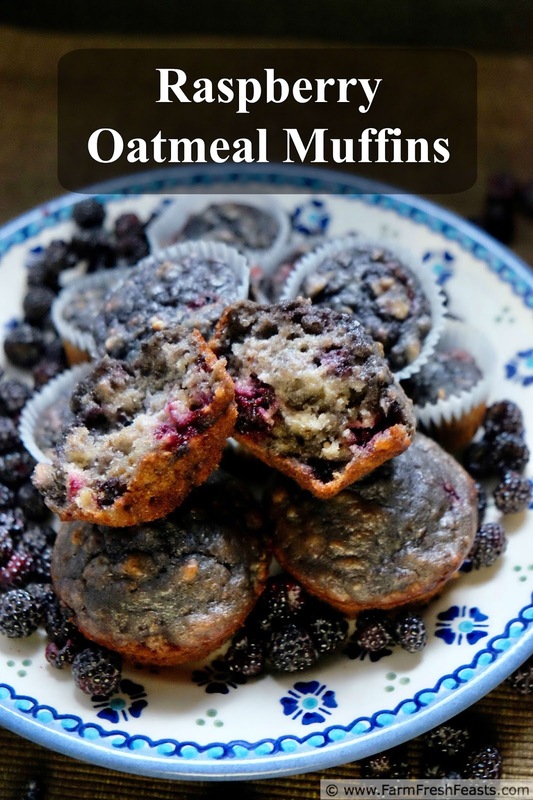 While these muffins use more sugar than I usually like in a muffin, they are still less sweet than a traditional American muffin. 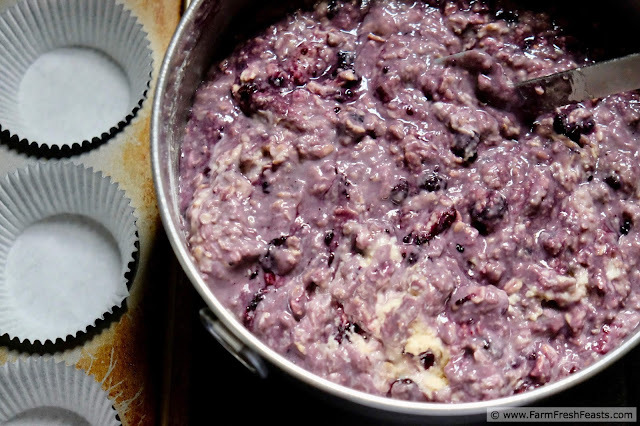 Wholesome enough for breakfast, the oats will help fill you up while the raspberries bring a smile to your face. I made a double batch of these and shared some with a new family, some with my coworkers, and some with my book group. I like how the gift of homemade muffins can be useful in multiple situations. For more recipes using raspberries, please see my Raspberry Recipes Collection. It's part of the Visual Recipe Index by Ingredient, a resource for folks like me eating from the farm share, the farmer's market, the garden, the neighbor's garden, and great deals on ugly produce at the grocery store. 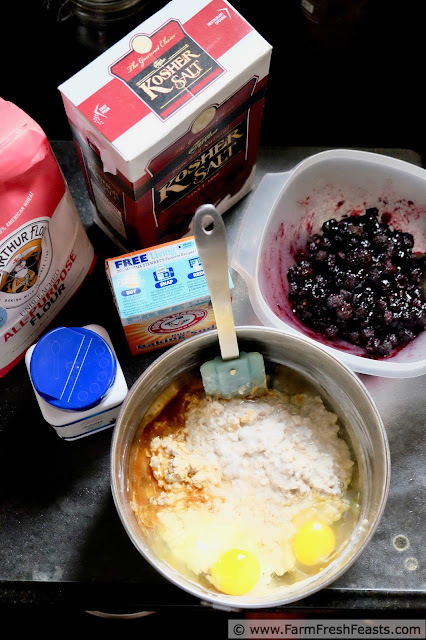 An hour before you're ready to bake, combine oats and buttermilk in a large bowl and set aside. Combine raspberries and brown sugar and set aside. If you're starting the night before, refrigerate each bowl overnight. When you're ready to bake, preheat the oven to 400 degrees Fahrenheit. Line a 12 well muffin pan with paper liners or spray with an oil spray. Add egg, oil and vanilla to the oatmeal mixture and stir well. Dump dry ingredients on top. Mix the dry ingredients into the oats briefly, then dump the berries into the bowl. Be sure to scrape all the sweet juice into too! Continue mixing until the berries are just berrily combined. Scoop mixture into prepared pan, filling each well about ⅔ full. Bake for 18 minutes. Cool in pan 5 minutes, then cool on a rack. Serve warm or at room temperature. 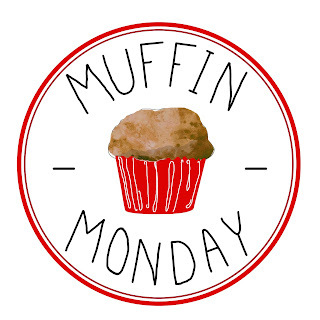 Today's the last Monday of the month, so I'm joining the Muffin Monday crew to share muffin recipes with my readers! Scroll down to see our efforts for this month! Small though you might think it, your garden seems wonderfully large and productive to me, Kirsten. Here in Dubai, I am happy if all of my herbs don't die in the hot summer. And the dirt is essentially sand so unless I am prepared to replace it all with good soil, I can grow those only in limited amounts. So, in conclusion, I'm jealous! Plus I've never heard of black raspberries. What gorgeous muffins they make! I'm jealous. We just moved so while we still raise our own eggs and I put some herbs out on my deck. I'm hoping to add some fruit trees this year and a berry patch next Spring. Then I will be able to make these Marvelous Muffins. Oh my goodness those look incredible - love the summer fresh berries in treats like this, and all that beautiful color! Add me to the list of the jealous! Your garden sounds wonderful. That you get enough berries to share with the critters and still bake and snack is fantastic. What a great idea to macerate the berries first. So much purple goodness. I would like the gift of these muffins. Ave and I ate are first home grown raspberry yesterday, and it was lovely. There's something about eating the fruits of your own labor. Definitely jealous of your garden. I'm one of those who loves the idea of having a garden but doesn't want to put in the work. I've been meaning to plant pumpkin and pepper for the longest while.